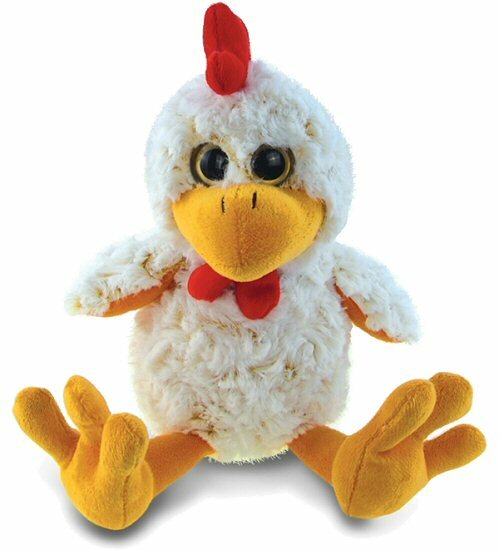 This adorable Sitting Rooster Super Soft Plush stuffed animal will feel right at home whether on the farm or in the big city, so long as he is with you. This plush rooster has soft swirly fur which is off-white with yellow roots, adding a fun extra dimension to its personality. With a cuddly body, red comb and waddle, and orange under wings, beak, and floppy feet, this rooster stuffed animal cannot wait to join you for hours of imaginative adventure. Fun Facts about Roosters and Chickens: Did you know that if a flock of hens does not have a rooster, that one of the hens will sometimes stop laying eggs, assume the rooster's role, and crow?